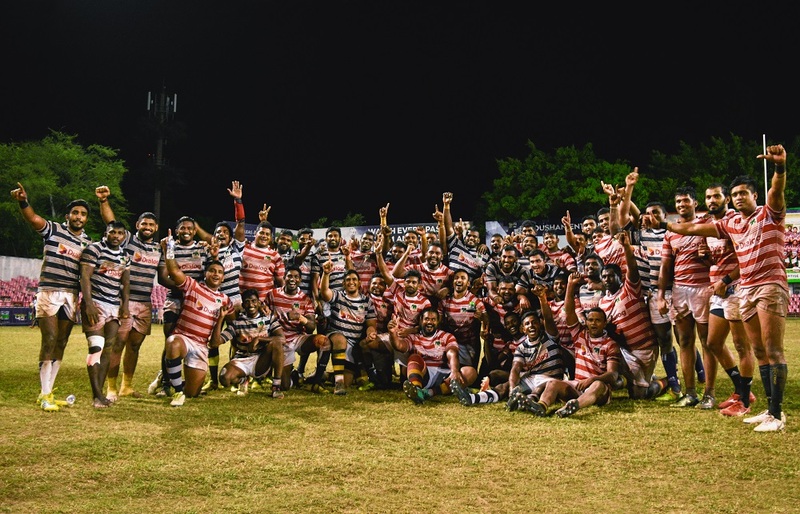 Team Outstation beat Colombo Origins 24-12 in the Clash of the Origins took place on 9th April, 2019 at Havelock Sports Ground which was conducted to raise funds for Rugby icon Mr Chandrishan Pereras treatment. The event began with the participation of the sports Minister Hareen Fernando as the chief guest in appreciating the massive performance of Mr.Chadrishan as a shadow in the field of sports, along with many other past cricketers, ruggerites and officials. The two teams Colombo Origins and team Outstation came to the grounds not in search for victory but for the first time in Rugby history both teams having one goal to play a fair game of respect for their mentors recovery. The game kicked off at 6.45 with Referee Hasantha Verangas whistle. 10 minutes into the game Reeza Rafaideen from the outstation team finally scored in the left corner but unfortunately Thilina Wijesinghe missed the conversion. Nevertheless the ruggerites didn’t fail to give an outstanding game in showcasing their talent and hard work. Both the teams were playing very attackingly using their big forwards. Finally the outstation team struck again when their captain Roshan Weeraratne scored after a brilliant passing from his team mates. Samuel Madhuwantha made the easy conversion and the scores became 19-0 with the effort of the speedster Thilina Wijesinghe. Colombo Origins had one final chance to make a score but the heat to win was blown by the referee with his half time whistle. During the second half of the game Prasath Madushanka from Team Colombo scored whereas the conversion was successfully completed by Reeza Mubarak where the score board changed to 7-24. However the outstation team retaliated with a brilliant try with the effort of Yakoob Ali. In the dying minutes of the game Sachith Silva made a dash and scored for the Colombo team in the right corner. Referee Hasantha Veranga blew the long whistle signalling the end of this fundraising encounter. Nevertheless the outstation team won the match and did justice to the fundraising. The champions of the outstation team together with the Colombo team celebrated their victory as they achieved what they hoped for. This event was attended by many of rugby and also those who associated Chandrishan sir very dearly. “One day when Im better I want to come back to MoraSpirit,” were the heartwarming words uttered by the wheelchair bound Chandrishan sir who was delighted to see the crew at this event. We dearly wish Sir a speedy recovery.